“Conan, what is best in life for hypertrophy”, a voice asked. Conan replied, “Train with light to moderate loads, use a high level of muscular effort, and employ a variety of isolation exercises.” Do these things and you shall grow, my son. That’s pretty much it. Of course, we can look a little deeper into these three points and that’s exactly what we’re going to do today. A recent meta-analysis (Schoenfeld, Grgic, Ogborn, & Krieger, 2017) concluded that there is no difference in hypertrophy when training with heavy and light loads. So wait, it doesn’t matter? Not so fast. It helps if you carefully read the actual paper, but a more accurate conclusion would have been that there is no difference in hypertrophy when using either moderate or light loads. Here’s a quick summary of the paper. The paper starts off with an acknowledgment to the conventional wisdom of training in the 1-5 rep range for strength and the 6-12 rep range for hypertrophy. 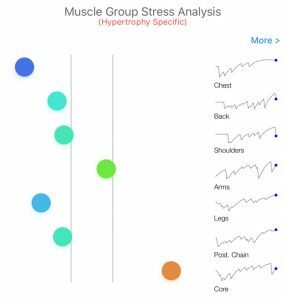 The authors searched the literature looking for studies where differences in strength and hypertrophy were tested under different training protocols. Once they had gathered studies they classified loads greater than 15RM as heavy and everything else was classified as light. Segmentation of heavy and light loads at 15RM seems like a poor choice when conventional wisdom, as stated in the paper’s introduction, puts the division between strength and hypertrophy training at 5-6RM. How can we make any meaningful inferences about the conventional wisdom when looking so far from it? The short answer is we can not. So this paper does not challenge that in any way. Instead, it shows that light loads (<15RM) can also be effective for stimulating hypertrophy. Here’s something interesting. Of the 21 studies included in the meta-analysis, only 3 used trained study participants. Examination of these studies showed comparisons between 8-12RM and 20-25RM. These were found to exhibit comparable hypertrophy, in accordance with the predictions of exertion load. So where are we now? Right back to the conventional wisdom about rep ranges for heavy and moderate loads. 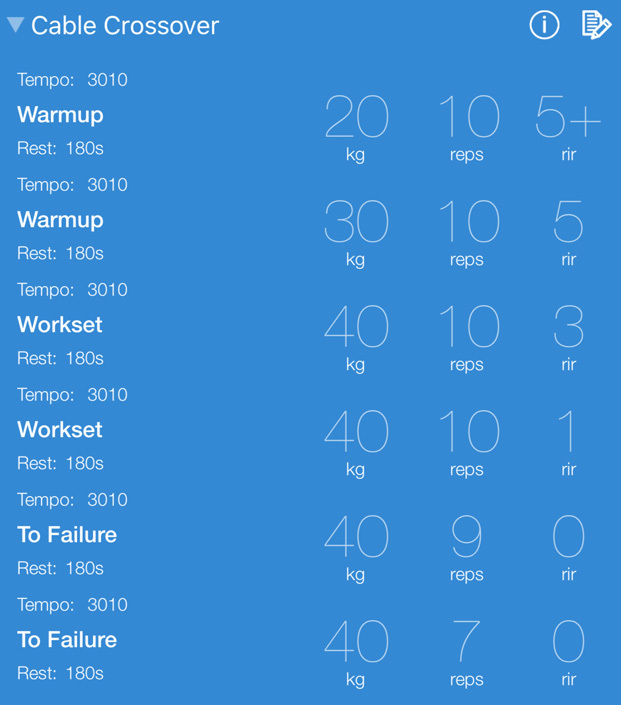 The difference is now we can also add light loads to the recommendations for hypertrophy. None of this is surprising when you consider exertion-load (XL), by the way. Let’s take a look back at that for a minute. XL per set peaks at around 10 reps to failure. However, the slight drop-off beyond that is most likely not significant. XL would predict similar hypertrophy from moderate and light load sets. Compare that to the predictions of volume-load (VL). Do 3×10@70% and you get 2100 VL points vs 3×20@60% to get 3600 VL points. According to VL, the lighter load would give you about 70% more hypertrophy. Yeah, that’s obviously not right. Bottom line: train with light to moderate loads when hypertrophy is your goal. What can XL tell us about various training protocols when it comes to hypertrophy? 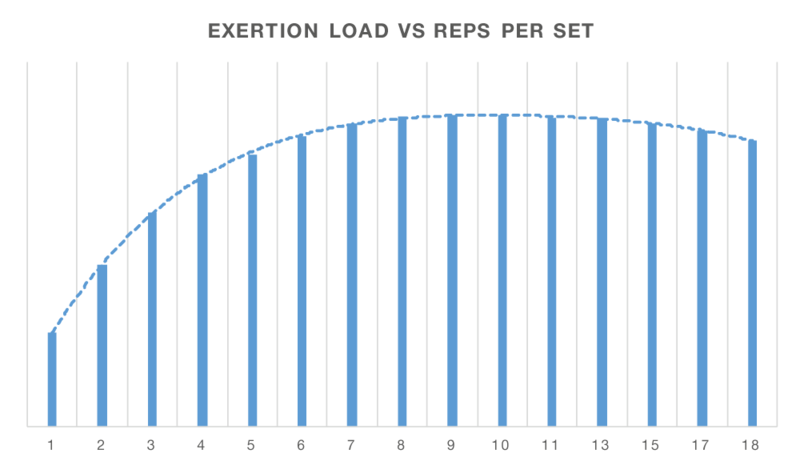 Let’s compare two volume-load equated scenarios: 1) classical sets across with the same weight and 2) rest-pause training where a brief rest is taken between sets to failure until a prescribed number of reps is reached (18 reps in this case). A typical training session following each protocol is given below. According to the table, XL load is about 44% greater for the rest-pause protocol and therefore, we’d expect to see greater hypertrophy with this approach, all else being equal. A recent study (Prestes et al., 2017) examining this exact situation demonstrated that the rest-pause protocol did indeed result in greater hypertrophy. In another recent study (Fink, Kikuchi, & Nakazato, 2016), the effects of short rest time (30s) with a 20RM load were compared to a long rest time (180s) with an 8RM load. The authors found greater hypertrophy with the 8RM protocol, although the difference was not significant. Without even considering rest time, XL gives us a similar prediction for greater hypertrophy with an 8RM load, although also probably not significant. The difference in rest times was therefore not a significant variable. 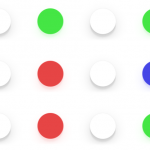 XL seems to give us insight that matches up with real-world results. It also shows us fairly clearly that training with greater effort (lower RIR) leads to greater hypertrophy when weight and overall volume-load is matched (rest-pause results). Bottom line: train with a high level of muscular effort if hypertrophy is your goal. 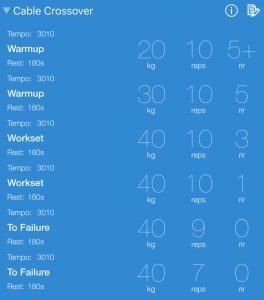 If you haven’t tried 20 rep sets of squats to failure, you’ve really got to give the experience a go. After you do that, do two more sets and make sure you have a good spot to puke nearby. Suppose your squat 1RM is 200kg and you did 3×20 to failure with 115kg, you’d rack up 1759 XL points. Although you can feel your quads burning during those sets, you can also feel the same feeling spread across your body. Even your arms get tired from holding the weight on your back. The point is that while yes, you accumulated 1759 XL points on paper, not all of your energy was directed into the quads. The actual XL points we can directly link with your quads is therefore somewhere below 1759. How much exactly we can’t say. 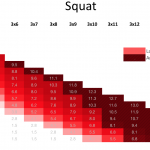 Now let’s suppose that the reason you decided to torture yourself with 20 rep squats is that you had heard they are great for building massive quads. While true, there could be a more effective alternative — or at least, less tortuous. Let’s further suppose your leg extension 1RM is 50% of your squat 1RM. You load up 70kg on the leg extension machine and do 6×10 to failure. That’s going to result in 1918 XL points. Even before considering the load diffusion you get from squats, that’s already a quadriceps hypertrophy stimulus greater than 3×20 squats. 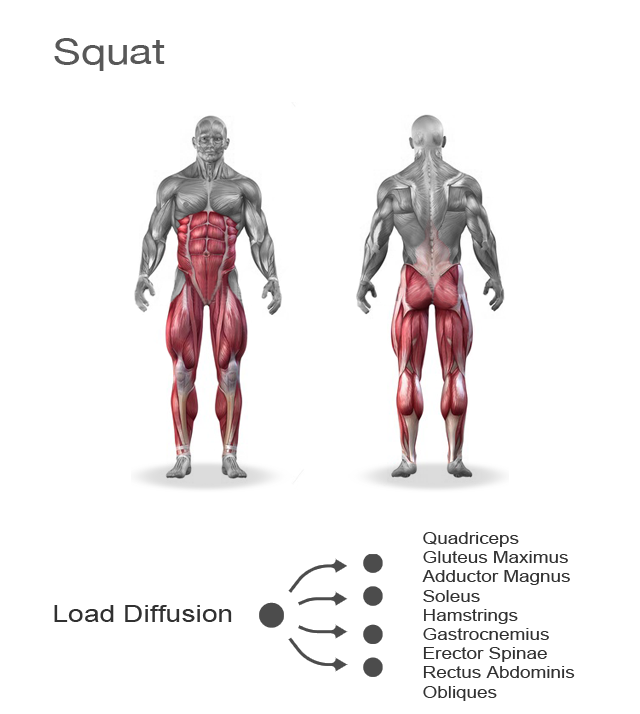 When you do factor in load diffusion, there’s a good chance that the difference between the two approaches is significant and in favor of leg extensions for quadriceps hypertrophy. Beyond that, you could probably move on to another exercise after 6×10. After 3×20 though, the whole vomiting thing may have put the breaks on that workout. Load diffusion makes the case for isolation vs compound exercises for targeted hypertrophy. As for isolation exercise variation, Wakahara et al. (2011) demonstrated differences in regional hypertrophy across the same muscle group for different variations of exercises targeting the muscle group. Preacher curls work the lower biceps? That appears to be the case. If you’re after maximal biceps hypertrophy then, there is no single, ideal exercise to accomplish that. So don’t go to the gym and do preacher curls every day. Mix it up. What isolation exercises lack in terms of long-term potential for improvement, they more than make up for in terms of variety. Bottom line: employ a variety of isolation exercises if your goal is hypertrophy. Start your workouts off by putting in some work using your body as a system to push weight around. We’re talking compound movements here with the primary exercises (e.g., squat, bench press, deadlift, overhead press, pull-up, and bent over row). With these, your goal is to move the weight from point A to point B. Coordinating the output of force across multiple joints and muscle groups are how we develop strength. 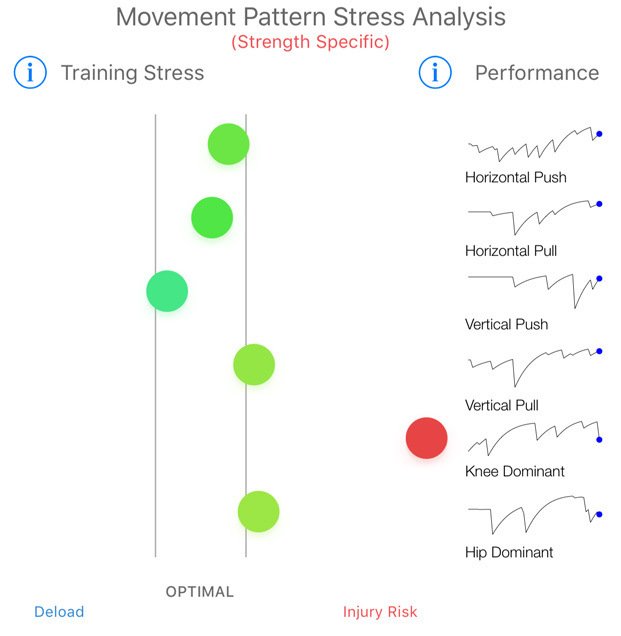 We can also refer to these exercises in terms of movement patterns. We’ll save a more detailed discussion about building strength for another day. Once you finish up your 2-3 primary exercises for the day, move on to your secondaries. If you are training primarily for hypertrophy, you want these to be isolation exercises for the most part, as previously discussed. 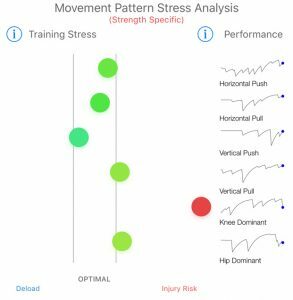 Since these don’t really have much potential for long-term improvement anyway, there’s no need to worry about complex periodization of curl variations. Just grab something and pump those biceps. Suppose your workout for today consisted of deadlifts and pull-ups. The periodization of those was all you had set up in your workout. 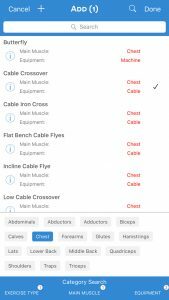 Once you finished those, you minimized your workout and scrolled to the following muscle group analysis showing your chest muscles as needing the most attention. Your legs also need a bit of work but tomorrow is a squat day so you decided to worry about that tomorrow. The chest was your main concern today. You brought your workout screen back up and opened the exercise database. 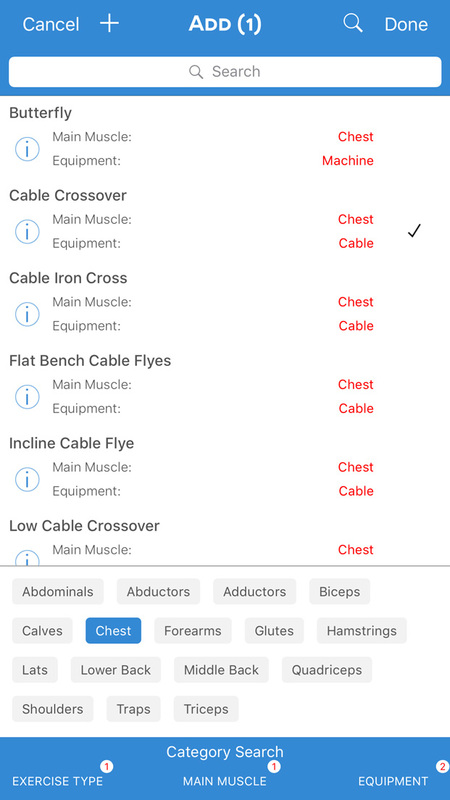 You selected the “chest” muscle tag, “isolation” exercise, and “cable” and/or “machine” equipment tags. That gave you the following exercises to choose from. You added the Cable Crossover and started off with 20kg for 10 reps. That was easy so you added a bit more weight. Once your RIR dropped down to where your sets were classified as “Workset”, you stopped adding weight and just tried to get through a few sets with the same weight. Finally, what is the best way of handling workout fatigue so as to maximize hypertrophy? One way to deal with interset fatigue is to keep the emphasis on reps and lower the weight so you can complete a fixed number of reps. Another option is to place the emphasis on the weight and keep the weight constant no matter how many reps are lost through fatigue. Examining the XL profiles of both options suggests that it may be better to place the emphasis on reps and lower the weight as necessary. However, while it is not clear whether the difference in XL points between the two methods is significant, go for maintaining reps if you want to leave no doubts. Generally, your workouts are composed of 2-3 primary exercises and 2-4 secondary exercises. So you could go through this process again and add a few more exercises before calling it a day.